RKSVA realized this early-on and has diligently incorporated a hands-on learning program by ROBONITE-Robotics & STEAM Education. The program is based around world's best DO & LEARN platform by LEGO. ROBONITE's hands-on learning solution helps student bridge the gap between key theoretical concepts and their real-world applications; this concept is being used by globally leading teaching institutions such as Carnegie Mellon, MIT and Tufts. At RKSVA learning by doing is an integral part of pedagogy. 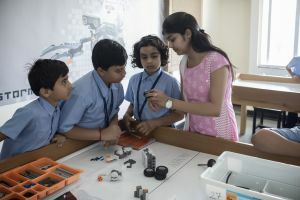 As early as early as student from Grade - IV onwards are accessing a state-of-the-art ROBOTICS & CS-STEAM (Computer Science-Science, Technology, Engineering, Art & Math) Education lab powered by ROBONITE.